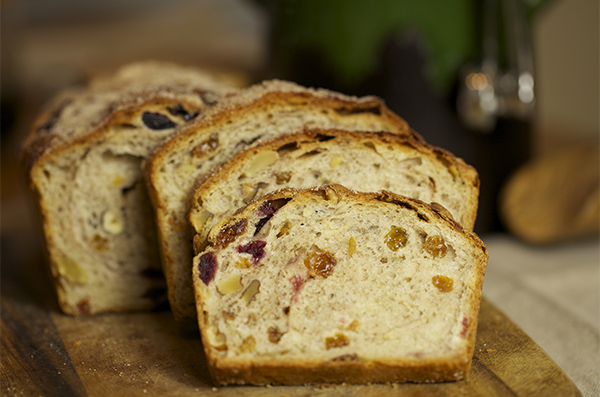 Freshly baked bread is even better when it comes with the aromatic pleasure of spices and fruit. What’s more, Panasonic bread makers feature an automatic raisin and nut dispenser that will evenly distribute the dried fruit through the loaf so that every slice is absolutely perfect! Your whole family will love this spicy fruit bread for breakfast or as a comforting afternoon treat. Place the ingredients (except dried fruit) in the bread pan in the order listed in the recipe above. Place mixed dried fruit into automatic raisin and nut dispenser. Select Menu ‘06’ (5hr), make sure the size is set to M and press start.